Ha-ha! After dragging out for more than a month, the thrilling conclusion to the gripping drama that is the review of the ever-mysterious Concentrator has been preempted due to my love of participating in the theme weeks that Rachelle occasionally proclaims from her mighty throne over at Living Between Wednesdays. 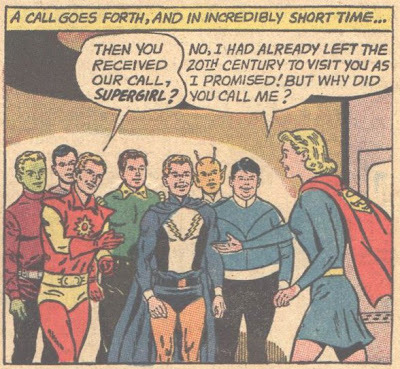 Naturally, I chose to write about Supergirl palling around with the Legion of Super-Heroes, and in an eerie bit of synchronicity, the first Supergirl/Legion story that I felt like writing about - and that Super Future Friends hadn't already talked about much better than I ever could - was Adventure Comics No. 313, featuring Satan Girl, winner of the last Paul and John poll! That sentence was too long and convoluted! Lightning Lass, surprisingly, is actually using her powers in a logical, useful and helpful way, instead of breaking my ability to suspend disbelief by, say, using giant lightning bolts to pick up trash or entertain the elderly by making hobos dance. Suddenly: illness! 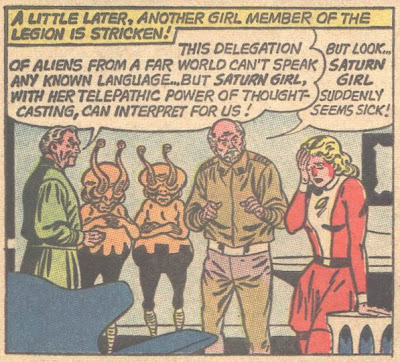 Saturn Girl gets sick, too, possibly due to those gross eye-tentacles. Or the discoloured patch on that old diplomat's crotch. Note, though, that she's doing useful, important work, too. Could this be the beginning of a new era of respect and equality in the Legion? Well, I'm not saying that this is a positive "No. ", this is a bit suspicious. Frankly, it sounds like the setup for an elaborate prank. "And then I turned on the engines! It was awesome! She was so embarrassed that I haven't seen her since, though I did find one of her shoes on the roof for some reason." Sheesh, really? 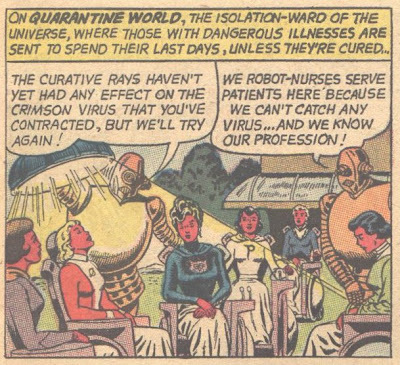 Quarantine World? Well, I suppose it is contagious... yeah, quarantine can't hurt, even if it doesn't seem to be much worse than a bad case of mono. 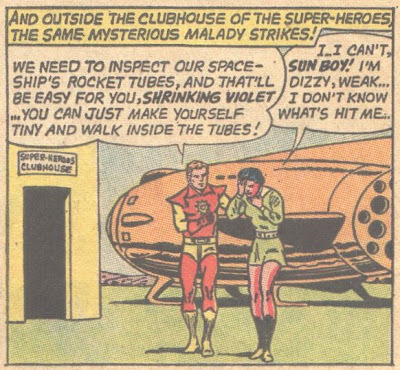 Okay, that's pretty harsh, Superboy. Seriously, they don't seem that bad. Look, they can stand up, all by themselves! 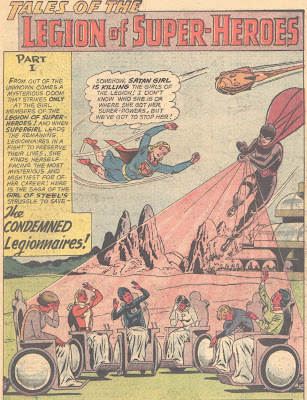 This is why Superboy isn't allowed in the Smallville Old Folks' Home any more, by the way. Satan Girl shows up! Satan Girl! This is... this is just the worst idea anyone ever had. Seriously, she might have had a slightly better chance of getting into the Legion if her name was Bad-touch Lass, or Kid Hate-crime. Or Duck-Murderer Damsel. 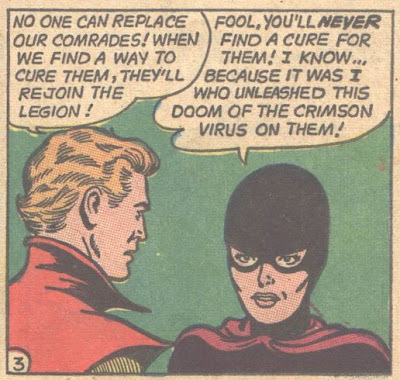 Even circa 1992, a character named Satan Girl would have a tough time getting into the Legion - I think that the best she might hope for would be a solo gig as a "troubled loner". With a dark, secret past. And yet she's upset when she doesn't get in. Despite her impressive cheekbones, Satan Girl just isn't the sharpest peach in the pie. Note, for example, the immediate confession of evil deeds. 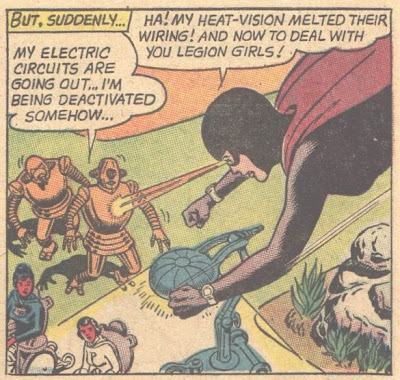 The Legion is thwarted, since they only have the one ship, and certainly don't have access to teleportation or time-travel technology (or the awesome might of the Concentrator, which remains a secret, bwa-ha). 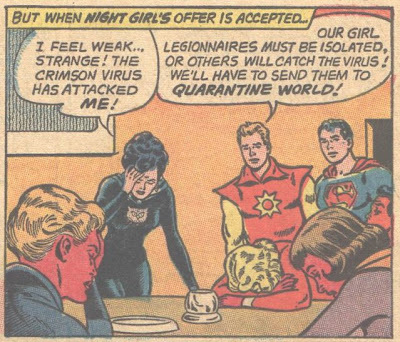 Since Superboy and Mon-El are off doing stuff, the Legion calls in Supergirl, and makes her Honorary Legion Leader because she's the only one tough enough to take on Satan Girl. All the boys wear their best doofy grins to meet her. I sure do like these robot-nurses - they're exposition machines! 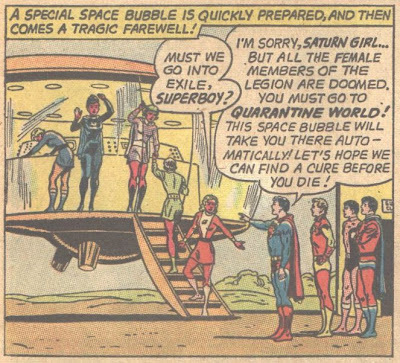 I bet they make that little non-joke about knowing their professions about three hundred times per day - note the expression on Saturn Girl's face. Hey... I just noticed that the robots have skirts on. Because... because they're nurses? I guess I am more attracted to them now that I know that they're female, so I'll let it pass. That's how I want to go - spewing exposition to the very end. Rest in peace, foxy robot lady. FLASH! WHIRL! SOCK! POW! Time for a hug! Aw, Supergirl. Heat vision is against the Girl Fight rules. Round One to Satan Girl. Actually, I'm pretty impressed with how this scrap was handled. Satan Girl's hair-pull in the above panel was the only "girly" move pulled by either contestant. And frankly, if someone was trying to eye-laser a mask off of my face? I'd be doing some hair-pulling, too. 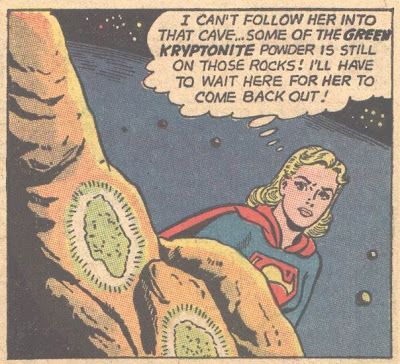 Since Supergirl figures that Satan Girl must be a rogue Kryptonian of some kind (and surely not a Daxamite or any of thirty or forty other super-powered races that've shown up by this point) she rounds up some still-incredibly-common-even-in-the-future kryptonite, to... well, when you get right down to it, to give Satan Girl a dose of radiation sickness. That's actually really harsh, Supergirl. 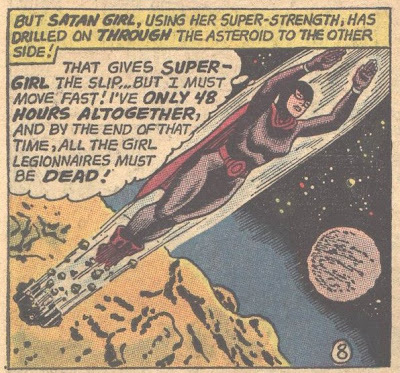 Too bad for Supergirl: Satan Girl is immune to the effects of kryptonite. 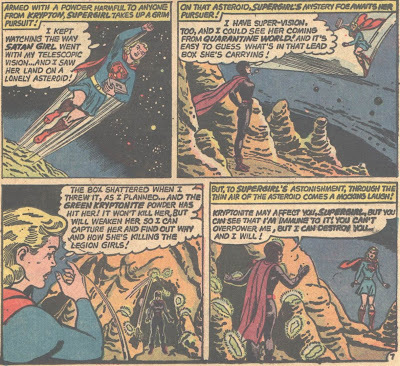 Which is good, actually, because since that box was full of dust it's probably all through her clothes and in her lungs and everywhere - if she were Kryptonian, she'd totally be dead, I think. ... while Satan Girl blasts out the back! 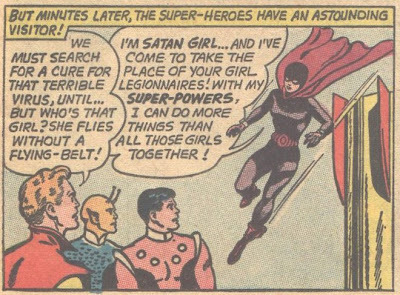 Damn, Supergirl - I think that Satan Girl is winning on points, so far. But can she keep up the pace and unleash enough dastardly maneuvers to win this one? We'll see, in Part 2! Okay, forks. I'll see you in a day or so for the stirring conclusion - soon you will know the mysterious, unguessable secret of just who Satan Girl is! Happy Supergirl Week, one and all.